Dependable Water Hauling Services For Your Business! Find out how we can help you with your water hauling needs. We offer safe and reliable solutions to meet your water hauling needs. We've been helping businesses for over nine years solve their water hauling problems. Contact us today to see how we can help you! Our team is experienced and dedicated. Making our services high-quality! Our team is made up of local experts who know what works best! Our support team is at the ready to assist you with anything, anytime! The following core values and beliefs guide U.O.W.S. everyday! 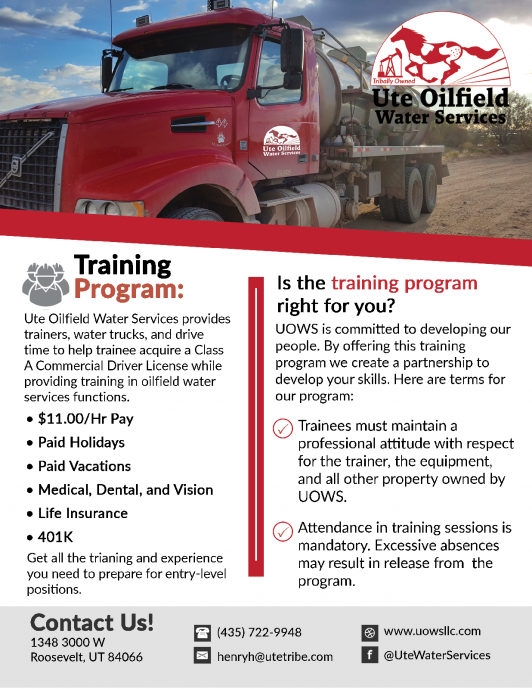 Established in 1999, Ute Oilfield Water Services (U.O.W.S.) has been the preferred water hauling company in the Uintah Basin's oil and gas industry. With over 40 trucks running everyday, we emphasize safety and team work to get projects completed successfully. Our quality services and experienced team have led us to make strategic decisions for safe water hauling solutions. We want each of our customers to have the best, reliable service that will help reduce their operational costs. 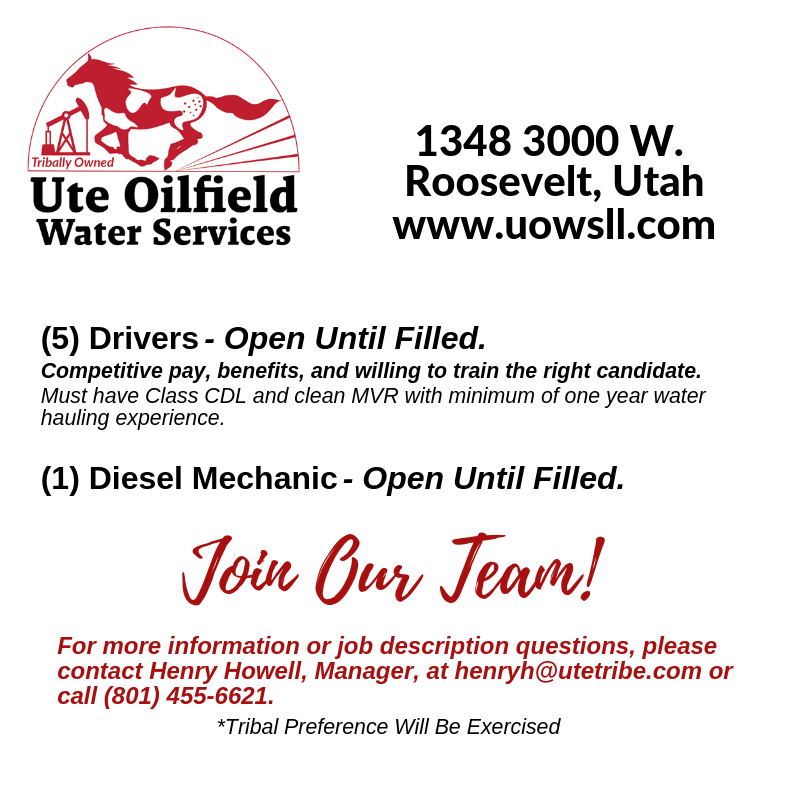 We are a business operation under the Ute Tribal Enterprises, LLC; the business arm of the Ute Indian Tribe. Deliver reliable, dependable, and safe services to the oil and gas industry, while providing development, training, and support for our community and team. Provide cost-effective and safe water hauling solutions. Safety First: safety is paramount. Honesty: operate with honesty, professionalism, and high-standards. Teamwork: working together to ensure our customers get the best services. Accountability: conduct business with integrity. Education and Innovation: sustain our future to always be the preferred water hauling company. Passion: show pride and dedication in everything we do. Respect: Treat our team members, customers, partners, and vendors with mutual respect. With years of experience in the oil and gas industry, our team prides themselves in offering our clients safe, reliable, and environmentally responsible services. If you are in the stages of planning your project, give our team a call. We strive to work closely with our clients to ensure needs are met. Learn more about how we can help you with all your water hauling needs! © 2017 Ute Tribal Enterprises, Inc.